Jaron “Boots” Ennis is tough to miss—and hard to hit. The 21-year-old welterweight from Philadelphia is flashy and can tear down an opponent with body shots, hooks, speed, agility and an over-abundance of skill. The only thing missing from the rising North Philly fighter is time. 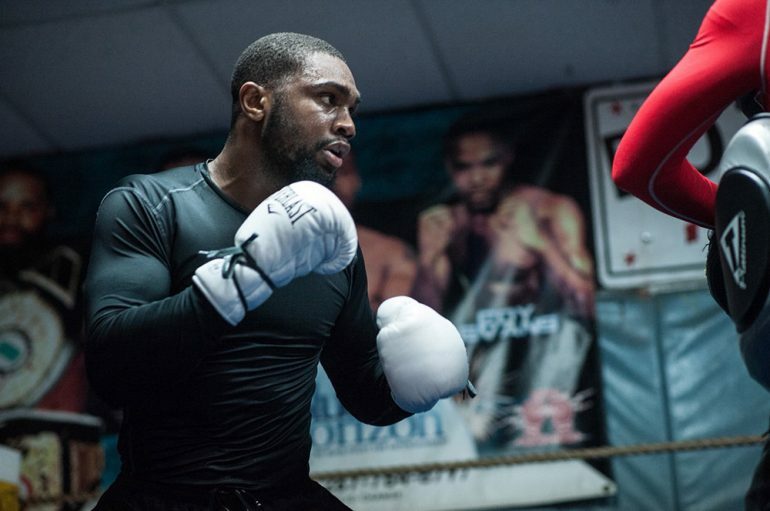 Because in no time at all, Ennis could be the next face of Philadelphia boxing—and a future world champion. Ennis (21-0, 19 knockouts) helped his brand with a thorough performance against rangy Armando Alvarez Friday night in Ennis’ ShoBox: The New Generation debut from the WinnaVegas Casino & Resort, in Sloan, Iowa. Ennis dropped Alvarez (13-1, 7 KOs) four times in the third round, which caused referee Adam Pollack to stop it at 2:59. The way Ennis broke down Alvarez speaks of his versatility. He showed flashes of a southpaw stance, an orthodox stance and an arsenal of angles that Alvarez had no way to combat. The first knockdown came courtesy of an Ennis body shot that set up a left hook to the chin. The second came from a left to the midsection, the third came from a left hook set up by a right uppercut and the fourth was from a barrage of glancing blows, by which time the gallant Alvarez had had enough. Ennis connected on 65-140 (46%) power shots (which included 34 body shots) and 72-193 total punches, while Alvarez landed just 20 of 150 (13%) total shots. “Ennis gave me everything that I thought that I would get,” ShoBox color commentator and Hall of Famer Steve Farhood told The Ring after the fight. “He’s just such a natural and his comfort in the ring is evident from the first second of the first round. What he showed moving up slightly in class tonight is that the welterweight division just keeps on giving. Regrettably, all anyone may want to talk about from the Iowa ShoBox show was what happened before Ennis got into the ring. In the co-feature, Zhora Hamazaryan was the victim of a deplorable decision. There was really no other way to describe what the 22-year-old Armenian endured. Hamazaryan looked very good in his American national TV debut—according to everyone in the arena except for two inexperienced judges from Omaha, Nebraska. He showed a little shoulder shimmy and roll in the opening round, à la Naseem Hamed, against Thomas Mattice in a scheduled eight-round lightweight bout. By the second round, Hamazaryan (9-1, 6 KOs) changed everything with a picturesque right to the jaw that dropped Mattice. The knockdown came at 2:41, forcing Mattice to hang on for dear life the remainder of the round. Hamazaryan tried to finish him, but Mattice (13-0, 10 KOs) showed the wherewithal to last the round. From there, Hamazaryan, who at 5-foot-5 was giving up four inches to the 5-9 Mattice, was the stalker. Halfway through the fight, Hamazaryan was the more dominant fighter, landing a total of 61 of 220 shots (28%) to Mattice’s 44 of 204 (22%), though the big difference came in Hamazaryan’s 41 of 144 (28%) power punches in comparison to Mattice’s paltry 19 of 68 (28%) power connects. Sensing some urgency, Mattice began opening up in the seventh. Still, Hamazaryan kept burrowing forward. With around 1:47 left in the seventh, Hamazaryan snapped off another perfect right that once again caught Mattice in the jaw, wobbling him. This time, however, Mattice did manage to gather himself quicker and got his legs under him. Hamazaryan landed a total of 134-499 (27%) to Mattice’s 97-393 (25%). Again, the power punches proved to be the difference: Hamazaryan’s 100-346 (29%) almost doubled Mattice’s power connects of 57-178 (32%). But somehow, some way, incompetence crept into the final decision. Mattice, despite being knocked down in the second and buzzed in the seventh, was awarded a split-decision victory. Certainly no one at ringside saw it that way — possibly even Mattice, who wore a look of resignation after the fight. The judges from Omaha, Mike Contreras and Jeff Sinnett, scored it 76-75 for Mattice, while Bob Lafratte, from Des Moines, Iowa, had it 77-74 for Hamazaryan. Hamazaryan was the more assertive fighter. He landed the heavier blows. Even Hall of Fame announcer Barry Tompkins called it one of the worst decisions he’s ever seen in over 40 years of calling fights. Mattice won the first round, but after that, it was hard to give him three more rounds. In a spirited eight-round junior welterweight fight, Kenneth Sims Jr. started the night with a split-draw decision against Montana Love. Sims (12-1-1, 4 KOs) actually looked pretty good, considering he had not fought in a year, recovering from surgery on his left elbow. Love (11-0-1, 5 KOs) did decent work, but was sporadic in his attack. By the numbers, Sims, who had lost some power on his shots in the later rounds, won the fight. He landed 33-143 (23%) jabs, 178-495 (36%) power punches for a total of 211-638 (33%). That final figure was 52 overall punches better than Love’s totals of 27-192 (14%) jabs, 132-336 (39%) power punches, which added up to 159-528 (30%).